A week ago I was bitten by a street dog, right outside my flat. I was walking to the shops about 8pm, along a badly-lit road, and it jumped out from behind a parked car, snarling, and bit me on the ankle. I was more surprised than anything else. It’s a dog that I see every day—street dogs are everywhere in my neighbourhood—and I didn’t even know it was there until it had nipped me. I checked out the bite as soon as I got near a street-light, and there was no blood, so I carried on to the shops, and then washed it thoroughly with soap and water when I got home 20 minutes later. And didn’t think any more of it. I just happened to mention this to some colleagues at work the following morning, and to my surprise everyone became very concerned, and insisted that I go along to a hospital for Rabies jabs immediately. I had organised my own Rabies immunisation before coming to India two years ago, so I hadn’t really thought about any kind of follow-up. Plus, growing up in the UK, where there is pretty much zero Rabies (or at least in dogs), I hadn’t given it much thought. But they quickly persuaded me otherwise. So, rather than sitting in my Monday-morning meeting, instead I found myself in an auto heading to the nearby hospital, which fortunately was only 5 minutes away from work. 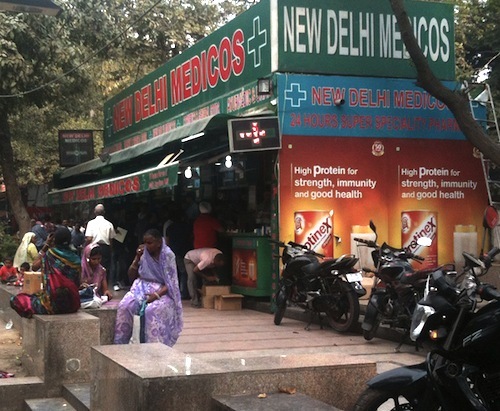 Although I had been to a doctor in Bangalore when I got some kind of “Dengue-like fever”, this was my first time trying to get hospital treatment, and I wasn’t really sure what to do. I tried to tell a receptionist what had happened, in English, but we didn’t really communicate very well. I knew that the Hindi word for dog is kutta, but I hadn’t thought to ask anyone how to say “bite”. She sent me down to the basement to “OPD”, which turned out to be a busy, unventilated and very hot Out-Patients Department. I didn’t really understand what was going on, and ended up standing at the desk there while everyone around me was barging and pushing and waving folders and X-rays and banknotes around. Some people seemed to be paying Rs 10 for whatever it was, while others seemed to be paying Rs 1000. I wasn’t sure if these were bribes to get seen quicker or what. I stood there sweating and waiting, switching position at the desk and trying to talk to someone for about half an hour. Eventually the hubbub died down a bit and I spoke to the receptionist, who told me I had to go upstairs to the emergency room. Somehow the word “dog-bite” made everyone take notice and I was whisked up there and seen by a doctor immediately, even though he was in the middle of talking to an elderly couple. It turned out they couldn’t give me any Rabies injections because this was a private hospital, and only government hospitals are allowed to give the jabs to foreigners. (Or so I was told.) So I’m sent back down to reception, where I started, and the lady there writes the address of another hospital on the back of a business card. This other place is in the centre of town, but I can get most of the way there on the metro. Shouldn’t be too difficult then. I’m starting to feel glad this isn’t some serious emergency. I had started the day without even thinking about this bite, but after the sudden concern of my work colleagues, and after being in an actual hospital, I started to worry a bit. Rabies is really serious, right? Like maybe-fatally serious. But I’ve had the immunisation. Ah yes, but then after that you have to have loads of painful injections in your abdomen or something. And what if the dog was properly rabid? Ah yes, but I see him every day and apart from this unexpected nip, he is just as docile as all the others sitting around doing nothing all day. So after a metro journey and a bumpy cycle-rickshaw ride, I finally end up at this huge government hospital, Dr Ram Manohar Lohia Hospital, or RML as everyone calls it. It’s a large campus kind of place, with lots of different buildings with signs for Cardio-Pulmonary Wards and a Burns Unit and all that kind of stuff, and a lot of people hanging around outside, sitting on the grass eating, sleeping, or helping sick and injured people to get from one place to another. I ask a security guard for Emergency and I follow his pointing finger. The Emergency Room is chaos. A bunch of policemen at the door are deciding who to let in, but they hardly give me a second glance, even though I’m the only white person in the whole place. Inside it’s packed with people. Sitting at a horse-shoe arrangement of desks are junior doctors, or so I presume, because they are young and some have stethoscopes around their neck. Next to each is a metal stool, and lines of sick people are waiting to sit down and talk to the doctors, who listen, inspect, and write things down on a large blue and white computer print-out. At the back of the room is a row of trolleys with people lying on them looking sick. Some of them have a companion holding up a drip going into their arm. Apart from the policemen, I can’t see anyone in any kind of uniform. 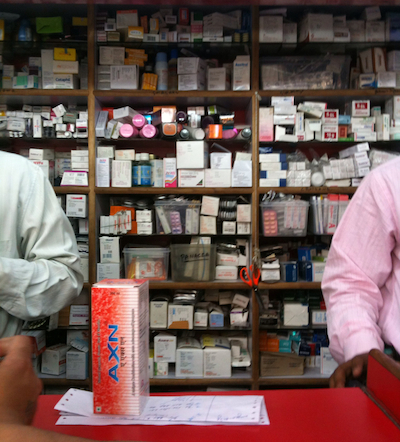 Eventually, after a lot of queue-jumping by people who look like they need to, I get to speak to a doctor. When I tell her about my bite she consults a colleague, and there’s a bit of confusion about whether I should go to “Room 305” or not. Eventually the consensus is that I need to come back at 2.30pm. Since it’s around 11.30 by this point I wander out of the hospital grounds, catch an auto to nearby Connaught Place or “C.P.” as its known (pretty much the Piccadilly Circus of Delhi), and take the metro home. At least there I can have some lunch, but more importantly pick up my vaccination records and the leaflet that came with my Rabies immunisation, so I can show the doctor exactly what I was given. By 2.30pm I’m back at the RML hospital again. Third time lucky. After more waiting and queue-jumping by elderly ladies I get to sit down on the metal stool next to a doctor, and tell her what happened. She writes down the details on a fresh computer print-out and tells me to take it to the counter where the nurses are, just behind us. After a bit of waiting, and faffing, and finally being told that I have to go to some registration counter first, I’m back at the nurses counter. At the very end is a stool, where people sit to have injections. Behind the counter are rows of boxes and needles and latex gloves and general hospital paraphernalia, and a couple of nurses reading the print-outs and loading up syringes accordingly. I work my way up the queue. The woman having her jabs just before me is sitting wailing. I guess she doesn’t like needles. When I reach the end of the line I get a tetanus jab in one upper arm, and a rabies jab in the other one. The print-out also lists some anti-biotics and some kind of syrup they want me to take. The nurse points out where it says I have to come back for more jabs after 3, 7 and 28 days, and then I’m free to go. And that’s it—no nasty or painful injections in the abdomen, which I find out later have been superseded due to different serum or vaccine or whatever it is. I leave via “Gate 6” where I’m advised I can buy the antibiotics, and sure enough there are lots of little pharmacies in huts right outside the gate. There’s no charge for the jabs, presumably because this is a government hospital. By this time it’s after 4 O’Clock and there’s no point trying to go back to work (we finish at 5), so I head back to CP, and get the metro home again, for the second time that day. After all the charging around in the heat, on top of working out what to do and whether I should be worried or not, I’m feeling pretty exhausted. But otherwise pretty healthy. Three days later, at 9am, I’m back at RML, clutching my blue and white print-out covered in Doctor-scribble. It says “OPD Registration Card” at the top. I eventually find the building with the mysterious Room 305 in it. The building is very big, with hundreds of people milling around. There’s a large atrium, and it’s all very dusty and run-down, with lots of blue and white signs everywhere in Hindi and English, and a huge notice-board listing what goes on in the hundreds of different rooms. Most of the walls are covered in once-white ceramic tiles, and it echoes with loud, excited chatter. It feels just like an Indian railway station, except nobody has any luggage, and there are some big staircases with lots of people going up and coming down. It turns out that this is the OPD for RML. When I get to the third floor, about 50-60 people are waiting outside Room 305, sitting on wooden benches in a corridor. Apparently everyone else is here for the same reason as me. Everyone is just sitting, waiting, and there is no movement. As usual, I can’t really see what the system might be in terms of queueing or tokens or whatever, but guarding the door is a bulky, fierce-looking lady in a blue shirt-and-trousers uniform that suggest she might be security. Somehow I find out that I have to go back down to the first floor, and queue with my print-out. I join the long line, and as I get nearer I see the sign indicating that counter 12, where we’re all queueing, is the “dog bite” counter. I’m beginning to realise that this is probably a big problem in Delhi. So I get checked-in or whatever it is the young chap does on his computer, and he stamps my print-out and writes some stuff on it, and says “three zero five” and points upwards. At least for once I know exactly where I have to go. Back upstairs, and there’s still no obvious sign of any kind of system. People are getting up from their seats in hopeful groups, clutching their print-outs and the security lady is letting some of them in, but shouting at others to sit down. Everything around me is in shouty, anxious Hindi. I realise that I am calm. Perhaps because I understand (mostly) the medical situation I am in, I know I have been immunised, and I know that the dog that bit me wasn’t foaming at the mouth or rampaging about the place. The women and children here all look quite frightened. I can’t see any number written on my print-out, and the security woman is not actually calling out any numbers as far as I can tell. She has the huskiest, growliest female voice I’ve ever heard for an Indian, and she’s not taking any messing around from anyone. An elderly lady in front of me with grey hair that’s mostly dyed orangey-red has “Monkey Bite” written on her print-out. That must have been pretty traumatic. I take my chances and join the current mob of 6-7 people trying to persuade husky security lady to let them in, and I sail through without really knowing what’s happening. Inside it is grey and untidy and boxes are piled right up to the ceiling on top of metal filing cabinets. It feels like a neglected office complex. We queue at another doorway in a very narrow corridor, and another security guard on a stool does various officious things like sending people back to the end of the line for no apparent reason, or getting people to weigh themselves on scales. Coming from inside is loud and constant crying from children who don’t like needles. Inside are 3 tiny cubicles, with a hand-written sign taped outside each: 1, 2 and 3. Just guessing, I go into Number 3 because it’s the closest, and I sit down. There’s an important-looking nurse behind a desk and two less-important looking nurses perched in what little space there is left, and a metal tray full of syringes with needles. While I’m sitting there, two other people come in and are given jabs about 2 feet away from me and then they vanish immediately. The important nurse looks at my print-out, and one of the others disappears with it. It’s hot and crowded and kids are crying. Sweat is running down my back. There is a complete lack of privacy, but nobody seems to mind. Someone comes back with my print-out and I’m sent to cubicle Number 2. This one somehow has 3 junior doctors sitting behind a desk, and two people sitting on metal stools in front of them, all crammed into an infeasibly small space. I have to stand. One of the docs asks me again about my immunisation, looks at the writing on my print-out, writes some more stuff about injections on the back, and sends me back to cubicle Number 3. I sit down on a metal stool, a nurse gives me a jab in each arm using the same syringe and needle, and I’m off out again. I jump on the metro and get to work by 10.30am. So that’s it so far. If I understand correctly, I’ll need to go back again tomorrow for jab #3, and again in 3 weeks, although nobody has actually confirmed this yet. I guess the government hospital was pretty efficient given how many people they are seeing, and it’s free. But it’s also chaotic, crowded, dirty and generally rather unpleasant. I imagine that hospitals in Victorian Britain were rather like this. Up until this episode my only experience of Indian hospitals was when I visited an expat friend after her operation recently, and that was a private one. It was like a 5-star hotel, with private rooms, TV, good bathroom, room service, and very friendly doctors. Supposedly 70% of people in Indian cities actually use private hospitals. After being in a government one, I can see why, although personally I have no complaints. It was just a bit traumatic, with not understanding what was going on, and it being so busy and—as with hospitals everywhere—full of sick people. But the jabs were free and I didn’t even have to show any ID or anything. 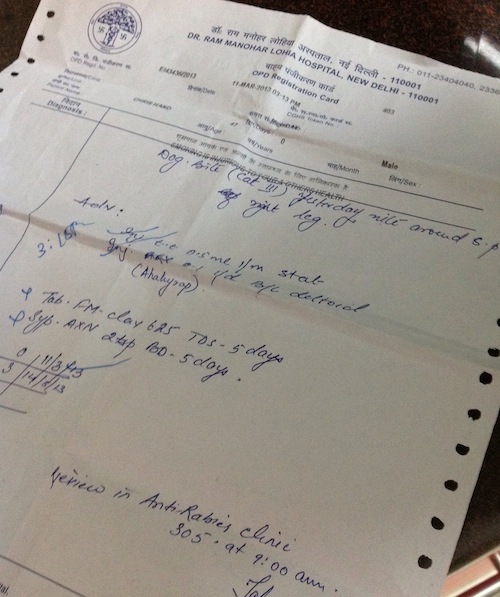 Apart from being asked where I was from when I initially arrived at the emergency room, and having to explain that I was going to be in Delhi for at least 2 years, nobody at all questioned my entitlement to treatment, or asked if I pay taxes or anything. I was quite impressed with that. So, overall, not an experience I would have chosen, but it was interesting to get an inside view of another part of Indian society that, otherwise, I would never have seen. I have to say that I’m rather wary of the street dogs now though.